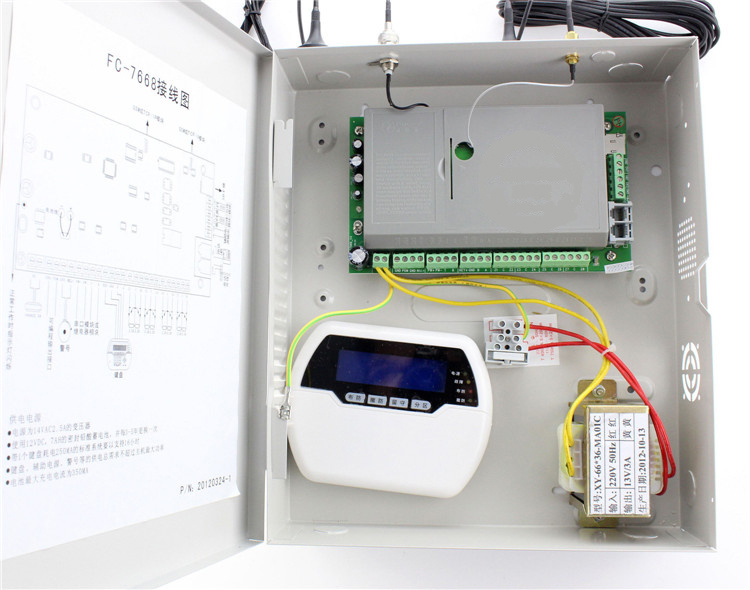 FC-7668 is professional grade residential and commercial burglar alarm system with wireless, wired and bus line connection with security sensors, fire detectors. It has built-in GSM module and PSTN double alarm dialing network. It is LCD keypad program metal case security service type alarm master control panel. 8 hardwired, 32 wireless and 128 bus zones available for equip detectors and 8 partitions for independent security control. With PGM out module and SD card port. Can upgrade from SD card and import zone name file from SD card. It supports 8 wireless 2-way siren strobe and 32 wireless electric switch. Can control house appliance by remote, mobile phone. It can be expanded to work with security camera and other automation kits with 16 Channel Replay Output module. Support 10 pcs LCD keypad and 16 remotes and programmed by LCD keypad. 1 installer code, 1 master code and 32 user codes. 1.It is office or small business security monitored alarm control panel. 2.It supports remote programming via telephone with voice prompt. 3.8 wired 32 wireless and 128 expansion bus zones. 4.8 partition for independent control by assigned remotes, keypads and phone No. 5.Can connect with alarm linkage output. 6.With door bell zone function. 7.With zone module expansion of medical, fire, emergency etc. 8.Keypad zone name can be edited. 9.User code authority can be set for certain zone. 10.512 pcs records of alarm events. 11.Siren time, sensor inspection, force alarming etc. can be set. 12.System Maintenance of battery test, communication test, walk test of detection range etc.